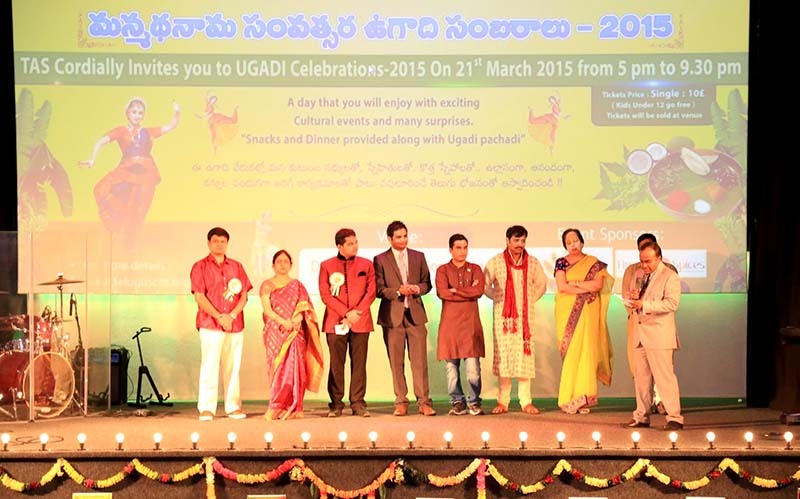 Edinburgh: A wonderful festive evening by Telugu Association of Scotland (TAS) on 21st March 2015 at Destiny Church, Edinburgh. 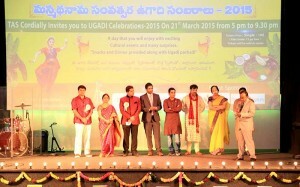 “Sree Manmandha Naama ((శ్రీ మన్మధ నామ సంవత్సర ) ” year event has a special recognition in the history of TAS, for the first time UGADI celebrations were conducted on the festival day. Being it is a festive day there was a huge turnout of people came across from most of the Scotland and few from England. The celebration began with “Jyoti prajwalana” and “Maa Telugu Talliki” song with a welcome note from Shyam Jayanty, Vice-Chairman by explaining 13 years history of TAS existence in promoting culture and tradition. He also mentioned about importance of learning Telugu language for the current generation and in order to promote this feature TAS supports a joint venture with Silicon Andhra’s “Mana Badi” – telugu speaking classes for the kids. Following on a wonderful line up of cultural arrangements (compiled by: Srimati Madhavi Danduri, Srimati Mythili Juttada and Sri. Benjamin Telagalapudi) and performances by the kids aged 3 to 15 years old. The main attraction of cultural programs were traditional dances, classical songs and dance skits for movie songs, entire crowd was mesmerized by the spell bound performances from kids. In continuation to the program Sri. Ramesh Golkonda, President welcomed our Chief Guest Sri. Shetty from the Indian Consulate General office, Edinburgh and delivered a speech by highlighting last year’s major events such as UGADI, Deepavali and ETV’s Swarabhishekam (a biggest musical event in the Scotland) and appreciated dedication from Sri. Siva Chimpiri, IT Secretary and Sri. Hemanth Pasumarthi, Treasurer to ensure all the events are completed on time and in budget. A follow on presentation (Video) about Telugu Language importance was well received by the crowd. Finally, the event has come down with distribution of certificates to all the performers and volunteers with a vote of thanks speech and ‘Jana gana mana’ by Sri. Ranjith Nagubandi, General Secretary who drew a special attention to the Volunteers who has helped at the event on that day and evening.